Correct Wheel Sizes, PCD, Offset, Rims and Tire specs for GMC Terrain series. i don't quite understand what "offset" means while looking for wheels , whts the difference between a 17" 5x120 w/a 18 offset & one w/a 38 offset? can somone help me? Hi,Henry,yes,you can change wheels and tires size.bigger width tire is ok,Can you show me your current tire size?I can help you confirm one. I have a 2010 GMC Terrain AWD and looking for used wheels to mount my winter tires on. Are there any other makes that are inter changeable? Hi,Paul,Can you show me your current wheel size?Is that 17'' oem? Hello I am looking for winter tires for my 2013 Terrain. my current tires on now are 235/60R17. The set I am looking at are 235/70R16 will they fit on my vehicle. Hi,Melanie,no,it can not fit for your car.Try235/65/16. Hi, my wife as a 2015 GMC terrain AWD tire P235/65R18 need to know if I can put winter tire P255/55R18 the height 1" and width is from 9.25 to 10.4 different , I want to make sure no rubbing when turning the wheels in wheel or suspension. Hi,Pierre,no,it can not fit for.Try265/55/18. Hi, I've got a 2013 GMC Terrain SLE 1 AWD. Currently driving on 235/60/17R all season tires, but am looking to get a good set of studded snows for our Maine winter. I'm looking at new dealers on eBay, but whenever I plug in my tire size and car info, they're saying that the tires are incompatible. Any reason why? Can the wheel rim of a 2010 terrain fit on the 2016 terrain Denali? I have a 2014 gmc terrain, needing just ONE 17 inch replacement stock rim, i found one online that looks exactly like mine but it says in the description that its 2010 through 2013. Are the 2013 rims not compatible with a 2014? I have a 2013 GMC Terrian and the 235 / R 17 tires that are on it seem a little smaller, can I put 265 / R 17 tires on it. It's a SLT All Wheel Drive. 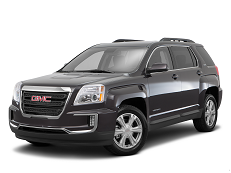 I have a 2011 GMC Terrain, can I place P265, 65R17 on this vehicle? Thanks! Hi,Alden,According to the tire calculator result,265/65/17 can't fit for your car. looking to purchase winter tires for my 2016 AWD terrian, the current size of my tires are 235, 55, R18, and the set i am looking at buying is 225, 65, R17. Will they fit ? I have a 2012 terrain SLE with stock rims and tires. my wife busted a rim and i have ordered another one but it wont been here for another week. What other GM rims and wheels will work until i get one in. Don't wont to run the donut wheel that long. My friend has an extra rim/tire off of a 2012 blazer. Will that work? Hi, I have 225/65/17 on my terrain right now, will a 16 inch steel wheel work on is model? 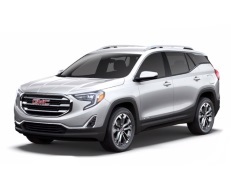 I currently have a 2015 GMC Terrain and have been offered winter tires from a 2010 Terrain with rims. My size of tire is 225/65/17 and the 2010 size is 215/65/17. Will this work? I have a 2014 GMC Terrain, current tire is 225/65/17, I am buying a set of winter tires @size 215/65/17, does it work ?also, would it fit in my current wheel? Hi,Keit,What the tire size you want?17''? Hi I have a 2011 Terrain. Current tire size is 235/55/r18 can i put 235/65/18 on it? Hi,Tom,Does your old explorer is Ford Explore?If yes,For the stock tires,It is 245/65/17. Hi,Ken,what the current Terrain Denli tire size? Is the 5x120 bolt pattern of a bmw the same as the 5x120 of a chev? And could you use a spacer accordinly for offset. Thanks. Hi,Ken,For bolt pattern,if it is same between two car models.The are same.But for offset,You'd better show it.I can help you confirm it. Hi,Neal,All 2014 gmc terrain car wheel have 5 bolt(5*120).So that wheels are not compatible.